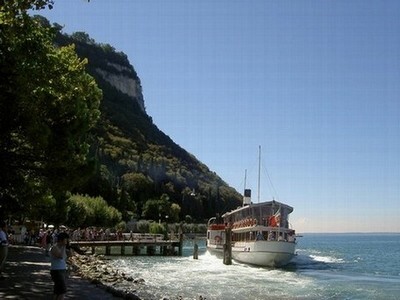 Situated between Lombardia, Veneto and Trentino, Lake Garda (or Benaco), is the largest Italian lake. At 65 meters above sea level, its surface measures 370 square kilometers; its widest point, found between Lazise and Moniga, is the 17 kilometers. Its longest point, 51 kilometers, rests between Riva and Peschiera. Total coastal development is 158 kilometers and its maximum depth is 346 meters. Unlike the other PreAlpine lakes, Garda’s origins are uncertain glacial tectonic. The design of the lake, similar to a fjord, is long and narrow and passes though the Brescian and Veronese Apls. Here, between Riva and Torbole, the principal affluent – the Sarca – is let in though the homonymous plain. The emissary, the Mincio, lets out a Peschiera in the southern part of the Lake where the basin opens into a semi-circular form reaching the Padana expanse. Always a popular tourist destination, Lake Garda has a particularly auspicious climate due to the imposing mass of water, its low level in respect to the sea, and its protected geographical position. These aspects have favored the formation of a Mediterranean type of vegetation with cultivations of orange, lemon, cedar and bergamot, and dating back to antiquity, olive trees and vineyards. Already inhabited during the Iron Age and the Bronze Age, the shores of the Lake saw quite a turn-over of Ligurians, Venetians, Etruscans and Gauls until the Roman conquest which started the rational exploitation of the surrounding territories. A city rose and with it a series of agricultural cultivations which intensified the traffic on the Lake. For centuries Garda has been a strategic point of passage between Northern Europe and the Padana Plain. The control of the Lake signified the management of the traffic between these areas – this brought on a succession of almost uninterrupted conflicts. After the Barbarian invasions and the Longobard occupation, came the reign of Charlemagne and later the period of communes and feudalism. In the ’300 the Lake was governed by the Scaligeri and the Visconti. This predominance was opposed by the Garda Commune (formed by Communes of the Brescia Riviera) who placed Garda under the protection of Venice. After a series of bloody battles with the Visconti, the “Serenissima” (Venice) succeeded in obtaining and managed to hold it through the ’400. Then with the Cambrai League its prestige diminished, but the rights of navigation remained in its hands until 1797 when the zone was conquered by Napoleon. Some years after, in 1815, Garda became property of the Hapsburgs and entered the Lombardian-Venetian Kingdome. With the renaissance, the Lake was reconquered by the Italians. Only the Northern part remained under the Austrian control, annexed after World War I.